Bernie Goldbach in LIT-Clonmel | Screenshot from a large Scrivener Project. SCRIVENER FOR WINDOWS has a Hot Fix that squashes a bug in compiling empty tables of contents in e-books. This was the biggest headache I had with the program. After many months of beta testing, Scrivener for Windows version 1.5.2.0 appeared as a free update to my Windows laptop. Besides fixing the empty TOC problem, it also runs faster, imports my podcast listening lists (and other OPML files), imports/exports Mind maps in freemind .mm format, exports CSV files and does other things that help keep projects ticking to completion. I am trying to run Scrivener with creative multimedia students as they manage functional Scrivener Projects. It's helpful to see Scrivener printing index cards, outliners, and that project presets extend all the way to the Compile dialog. Students will save several hours in practical sessions because it is now impossible to delete Scrivener project files within the directory of an open Scrivener project. I also like the added ability to see submenus and to sort snapshots. As e-books become more of my semesterised work process, it's good to see Scrivener handling CSS support throughout the editing process. And it's also nice to know that Windows 8 won't reject Scrivener since the program is Windows 8 compliant. Over in the Scrivener forum, I read about continuing progress with Scrivener for Android. It would be an excellent addition to our Nexus library of applications. Bernie Goldbach teaches Scrivener in the creative multimedia degree programme at the Limerick Institute of Technology. Bernie Goldbach in LSAD-Clonmel | Photo of Niall Condon's iPad. THE READING HABITS of creative multimedia students have changed during my past 11 years in the classroom. They're almost exclusively electronic now. I asked a small group of fourth year students on campus about their reading habits, following a set of questions that emerged on Audioboo. Although I could have predicted the overall answers, I'm fascinated by (1) the need for quiet or intimate space and (2) the lack of electronic note taking while reading. Both of these reading patterns earn my respect because I now know without a doubt the length of time a well-focused mind takes to truly make a deep dive into long form reading. In my own life, if I expect to comprehend and remember more than half of what I'm seeing on a screen or on a page, I need to carve out time and place to read, really read. You can hear what my students think about this idea in the audio clip they've made for this blog post. Listen to "Reading Habits Shared" on Audioboo. Bernie Goldbach is the senior creative multimedia lecturer in the Limerick School of Art and Design. Bernie Goldbach in Cashel | #impacteq on my Kindle. 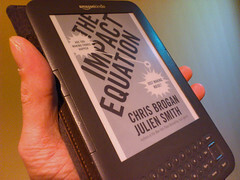 THE IMPACT EQUATION, a business book by Chris Brogan and Julien Smith, has given me a very valuable perspective about the conversation platform I'm using online. I'm going to use several examples from the book when teaching social media for business. I dove into the Kindle version of The Impact Equation instead of watching Ireland's Late Late Show and believe I know I derived more value from my Friday night by reading and annotating Kindle pages. The book (and its vibrant online ecosystem) will provide talking points and workshop material not only in academic activities in the Limerick Institute of Technology but also for several Skillsnet workshops we run in southeast Ireland. This is a book with solutions, not just social business marketing theory. SOMETHING VERY INTERESTING about the spread of contagion intrigues me. David Quammen writes about the spread of virus in a fascinating way. The emergence of strange new diseases is a frightening problem that seems to be getting worse. We're connected by easy intercontinental routes and our use of speedy travel increases the probability of a worldwide pandemic in our lifetimes. Reports of Ebola, SARS, and AIDS on the nightly news have become so commonplace that we easily miss the the big truth that such phenomena are part of a single pattern. The bugs that transmit these diseases share one thing: they originate in wild animals and pass to humans by a process called spillover. David Quammen tracks this subject around the world. He recounts adventures in the field—netting bats in China, trapping monkeys in Bangladesh, stalking gorillas in the Congo—with the world’s leading disease scientists. 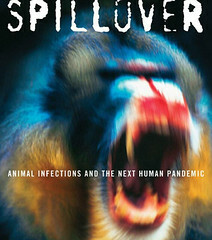 I'm reading Spillover to learn how these diseases originate. He writes a literary crescendo that asks the terrifying question: What might the next big one be? I hope it doesn't take me out. I KNOW DOCTOR SEUSS from years ago when he introduced me to green eggs and ham. 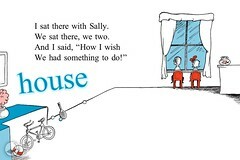 My daughter first met Dr Seuss through the Cat in the Hat app. I listen to our 4yo as she lets the app read the story to her. But more often than the audible book, I hear individual words being read out loud when Mia touches items on screen--like the house in the screenshot. From my view over the shoulder, I think Dr Seuss is helping Mia learn nomenclature of her home and her place. 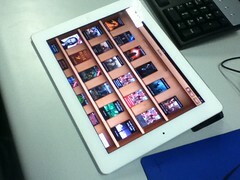 Occasionally she creates a permanent view of her learning space by taking a screenshot of her in-app activity. I'm intrigued by Mia's progress and plan to continue my careful observation of what she is learning from authors I knew more than a generation ago. Bernie Goldbach is journaling thoughts about #howilearn. WHEN ADRIAN WECKLER gives double truck coverage to a technology, trend or business, it normally means it will become part of the fabric of life. 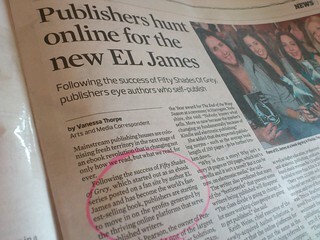 He's done that with e-books in the Business Post. Personally, I hope he's right, because I've seen the result of high production values in an e-publishing module we teach at the Limerick Institute of Technology. 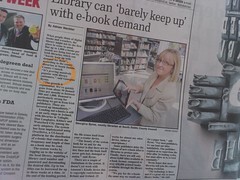 I wish I could get portions of the Business Post in some form of iBook or mobi file. Regular content like the Reality Bytes column, the Tech Week paragraphs, "Gadgets of the Week" and even the advertisements that frame the tech section (this week they're from the National Ploughing Championships and MobileReady.ie) could play well on my iPad or Kindle. It doesn't take much to make a content management system export the .epub and .mobi file types. We have qualified students who could spend a fortnight inside any newspaper and show how they make easy work of e-publishing. Amazon has shown that a timely e-publication has a commercial value (say 93 cents per collection of 20 items cited above). But I'm more interested in the public touchpoints of e-publications--things you might see in traditional libraries. I BOUGHT THREE SUNDAY PAPERS because I thought we'd be waiting a while. Waiting stretched through the night while I read e-books. Several of the e-books I have on my Kindle are self-published works. Unless you know the distinction between self-published and vanity publishing, you could tar both with the same brush. To hunker down by yourself and meet the Apple or Amazon standard for a title means you're doing a lot of work. However, in most of Irish mainstream media, having an electronic title won't get you on chat shows. And the detractors are quick off the mark with snide comments about authors who did not follow the normal slog of using an agent, publishing house and publicist. But things are changing in e-publishing and I'd expect public perceptions to change as well. THE ANNUAL Pen & Pixel Exhibition in LIT-Clonmel features excellent creative multimedia work but this year is the first to include a hard cover book, HDR imagery and epubs. The image in the blog post comes from Edgaras Zvirblys, a talented photographer who has imagined images you might find while shadowing soldiers in a nuclear apocalypse. It's a Blurb Book. Buying mine to help a starving student http://bit.ly/GGHqRo who is Behanced. Edgaras Zvirblys (aka edzed) on Blurb -- "Soliders in a Nuclear Apocalypse"
Sent Typepad app to blog using O2-Ireland MiFi service. I ORDERED MY FIRST VOOK today, a fun read from Brian Brushwood. I'm sure it deserves top billing as the best Vook of 2012, even though the year is young. A Vook is a hybrid between a digital book, a movie and online interfaces. Vook's processing power lets me create rich media reading experiences in one pass. A lot of publishing houses (more than 30 the last time I checked) have forged relationships with Vook and hundreds of multimedia selections cover selections across fiction and non-fiction. A Vook behaves like an ebook. That means you can enlarge text, scroll around content, flip pages, insert bookmarks and skip to different chapters. 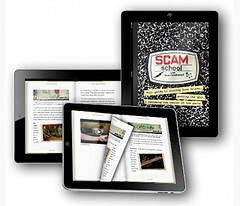 I can get a Vook for my iPad, for my Kindle, to read while online, or to download and read on my laptop. This is a big deal for multimedia creatives because it means being able to resuse many rich media objects by crafting them inside a Vook. My daughter likes seeing Vooks in full colour. They are more engaging than the black and white Kindle screen. I WORK ACROSS THE HALL from a small library set on significantly reducing the footprint of books on its shelves. I hope that means a significant increase in the number of electronic titles. And why not? Throughout my life, a large swath of what I need to know has been digitized. The key analogue elements are truly artefacts of my ancestral heritage and it's up to me to bring that content into the digital era. As I push my content from working notes on my laptop to lecture notes for download, I can see students connecting to the core material without even coming into the classroom. Plus, I can see prospective students an ocean away dipping into materials that can help disparate cultures connect through learning. I'm watching the content shared by the Digital Public Library of America [DPLA] while hoping its growth can offer a case study in how Ireland might create the infrastructure. I think we could start with prodding Irish academics to digitizing their data and then share their efforts across the Republic in collaborative efforts that promote new knowledge and scholarship. Such an effort would foster a community spirit that would trickle over into the public library system. And if the little library across the hall guts one-third of its shelf space this summer, I think we'll see such a digital library as part of our Limerick Institute of Technology course catalogues before the end of the decade. Michael Posner -- "Creating the public library of the future" in the Globe and Mail, March 2, 2012.